And now something completely different. 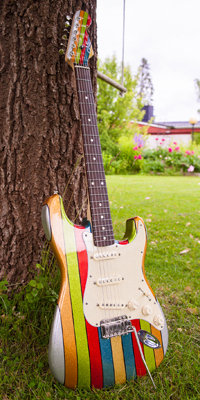 This is my second custom-made guitar ever. It is, like the previous one (the Telecaster), an artisan crafted instrument by luthier Pekka Mäkinen at GAS Guitarworks, Tampere, Finland. I had - in a whim - recently sold my long-time workhorse Stratocaster that I owned for about 10 years and used on more than 200 gigs, so I was in this strange situation that I didn't have a Strat at all. About a year earlier I had acquired a very nice Ludwig Classic Maple drumkit in the most unusual and rare Salesman Sparkle finish, since playing drums is probably the best hobby there is for a guitarist. 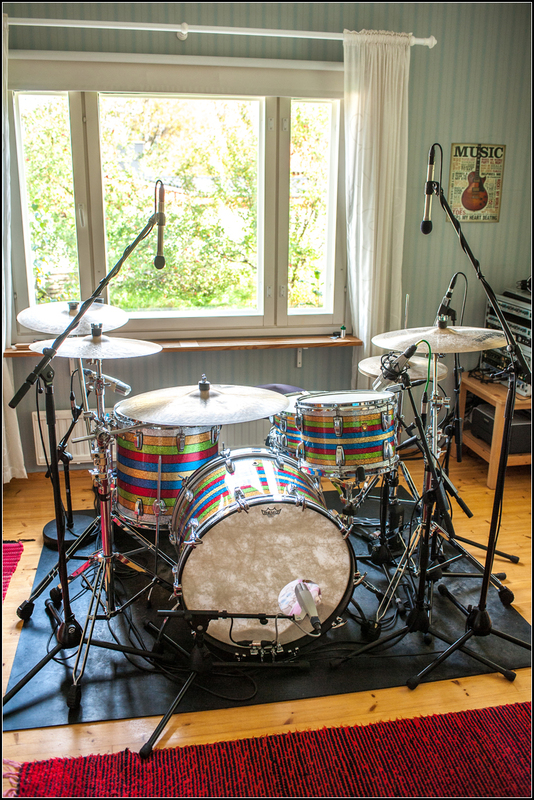 This very kit is actually a part of Finnish rock music history, since it used to belong to Sampo Haapaniemi, one of the great Finnish drummers. You can hear the kit in both Egotrippi's and Tuure Kilpeläinen's records and it was also used live in several occasions before Sampo sold the kit to a friend of mine, who then later sold it to me. You'll find several videos of this very kit being used in YouTube in case you're interested. 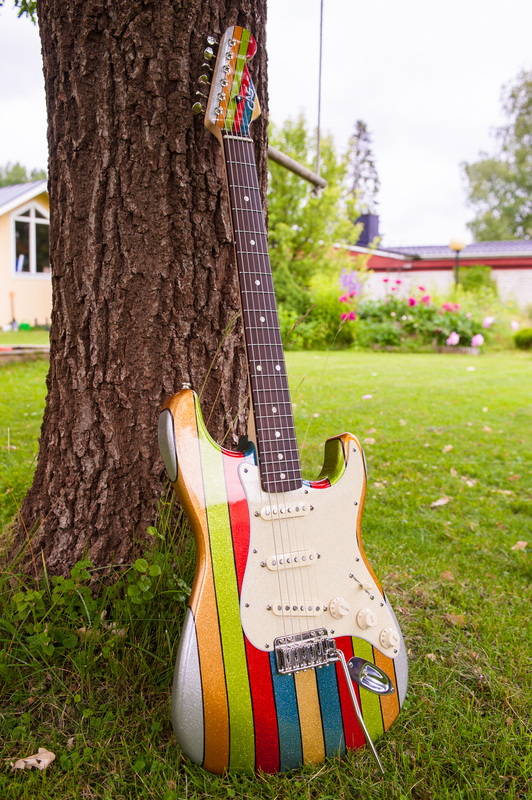 Anyway, suddenly there was a Strat-shaped void in my guitar arsenal and that pretty soon made me feel a bit uneasy - after all, Stratocaster probably still is the guitar model I've used the most since I started playing. Then one day I just thought "why not have a guitar that would feature a finish that matches my newly-acquired drumkit?" The whole idea felt so crazy in my twisted mind that eventually there was only one way around it. I had already ordered one Telecaster from Pekka and I was pretty sure he would be brave enough to accept the challenge. A couple of months later I saw the stripes on the body for the first time, and I can tell you: it was really hard trying to stop smiling. It was just as over-the-top as I had hoped for - in a good way. I'm pretty sure this is the only guitar on the whole planet with this kind of finish. Just like the last time, I got to choose everything from the tonewoods to all the bits and pieces such as electronics, hardware, knobs and whatnot.